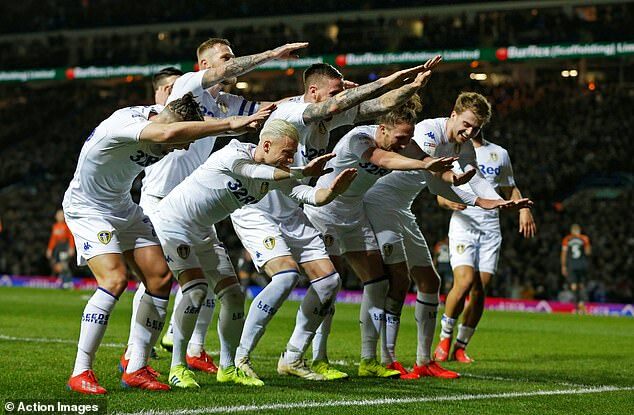 For so long this was a Leeds performance in the image of Marcelo Bielsa as they returned to the Championship’s summit. A tigerish appetite, a ferocity in midfield, a definitive drive in possession. Certainly the sort of display the manager devours. Yet then the jitters set in. Inexplicably, really. Elland Road tensed. Pontus Jansson and Jack Harrison had scored before half time – Leeds in complete control – but a cloud of nerves shrouded this old ground. It is what happens in this division. The Premier League’s allure leaves even the best slightly weak. 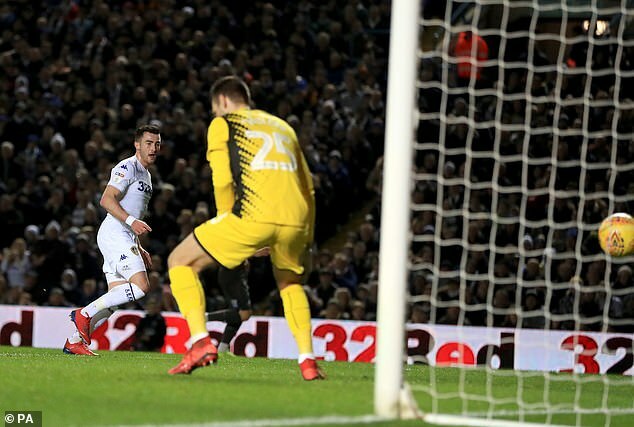 Swansea were forcing Leeds back for the first time in the final third, then awarded a penalty after Luke Ayling clumsily tripped Joel Asoro with three minutes remaining. 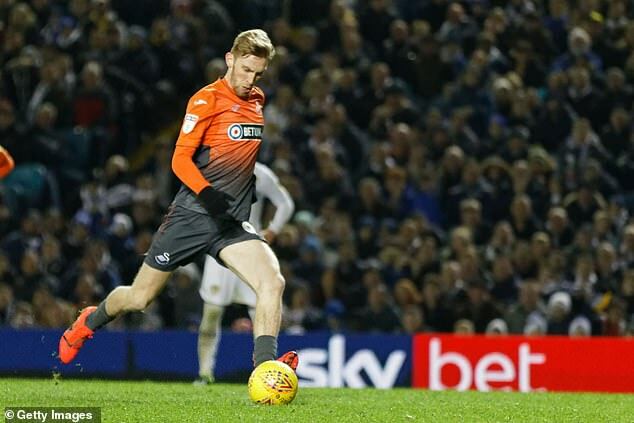 Oli McBurnie converted, leaving the majority of 34,044 inside restless. They fidgeted through four minutes of stoppage time, in full knowledge of Norwich’s capitulation at Preston. Bielsa pleaded for the whistle, his backroom team all at the edge of their technical area barking instructions. Leeds: Casilla, Ayling, Jansson, Cooper, Alioski, Phillips, Hernandez (Davis 90), Roofe, Klich (Shackleton 77), Harrison, Bamford (Roberts 71). Subs Not Used: Peacock-Farrell, Brown, Stevens, Halme. Goals: Jansson 20, Harrison 34. Swansea: Mulder, Naughton, van der Hoorn, Carter-Vickers, Grimes, Roberts, Fulton (Asoro 56), Byers, James (Narsingh 68), McKay (McBurnie 61), Celina. Subs Not Used: Nordfeldt, Dyer, Baker-Richardson, Harries. The collective sharp intake of breath was agonising. 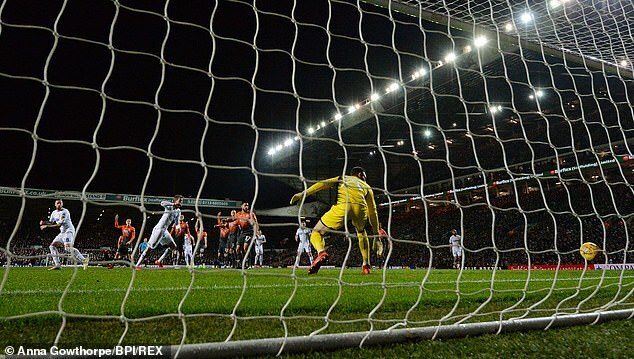 Leeds, hacking to safety, were only hanging on by virtue of missed chances, chiefly Patrick Bamford’s two big ones. ‘It is hard to understand that we only won by one goal because we dominated the game,’ Bielsa, who has been irked by recent profligacy, said. The manner in which Leeds held on might make this result one of their most important should promotion ensue. These have been troubling weeks, with four defeats in seven and the microscope that was Spygate. Grit was required and they showed plenty. Now for a 10-day break. Jansson’s goal, on his 28th birthday, was cleverly diverted in after defensive indecision, while Jack Harrison’s header was a product of his ghosting run, galloping on to Ezgjan Alioski’s wicked cross. Swansea could not live with their hosts for more than 70 minutes. Poor Daniel James, who saw a deadline day switch to Leeds collapse, was on the periphery until he was afforded a standing ovation by mischievous home fans when substituted. ‘Away from home, I would say that is as tough as it’s been,’ Swansea boss Graham Potter conceded.